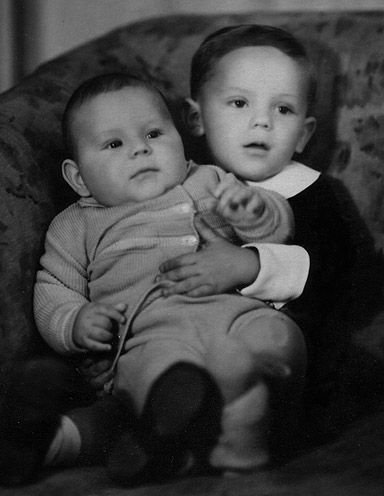 A photo of my brother and me as infants. I was an eleven pound baby and my mother was quite tiny, so I don't think she was overjoyed at my arrival! My brother Viacheslav was born in Shanghai in September, 1935, and I must have been conceived there sometime in December, 1936. It was a difficult time for my parents, Tonia and Ivan Atroshenko. The global economic depression of the 1930s had not affected Shanghai too badly but jobs were scarce for White Russians like my father. Social security did not exist for Stateless emigres like him. To make matters worse, on August 13th, 1937, the Japanese military attacked the Chinese controlled sections of Shanghai causing widespread confusion and misery amongst the Chinese population. The Japanese expected a quick victory and had boasted that they would occupy Shanghai in just three days and that China itself would surrender to Japan in three months. To everyone's surprise, the poorly equipped Chinese Nationalist army under Chiang Kai-shek put up a determined resistance and the battle for Shanghai lasted for three months. Although the Chinese eventually lost their sections of Shanghai, suffering some 200,000 casualties, the fact that they had held out for so long was a great morale booster for them. The Foreign Concessions within the city continued to be administered by various European Powers, such as the French and the British. The Japanese never managed to conquer the whole of China, although they did inflict immense suffering upon the Chinese population in the years to come. My father hated the Japanese. He had been a boy soldier in the Russo-Japanese war of 1905 and had witnessed atrocities committed by the Japanese army in that conflict. Not wishing to live under Japanese military control, he somehow managed to obtain passage for his family and himself on a tramp steamer to Hong Kong. When the ship arrived in the British Crown Colony, my family was informed by the authorities that they could not remain there. They had to return to China and apply for proper visas to gain official entry to the Colony. They were advised to sail with the ship to Canton (now called Guangzhou). Because of the Japanese military aggression which had spread south, thousands of Chinese were desperate to enter Hong Kong hoping to be protected by the British. Thanks to the huge influx of people, typhoid and cholera epidemics were raging throughout the colony and the British authorities were at their wits end trying to sort out the problems brought on by the flood of terrified refugees. No sooner had my father been told that he and his family had to go back to China, my mother began to experience the pains of childbirth. I was about to make my entrance. She was rushed to the Matilda Hospital which is close to Victoria Peak. My father and brother remained on the tramp steamer in Hong Kong Harbour. The Chinese believe that the number four is unlucky. On the fourth day of my existence, Hong Kong was hit by the worst typhoon in its history. In the harbour itself, normally protected from severe winds, about thirty ships dragged their anchors and were swept ashore. It was later estimated that eleven thousand people died in the colony during the storm. A tidal wave 18 foot high swept away the village of Tai Po in the New Territories. Hundreds of junks from the fishing village of Aberdeen were smashed to pieces by the huge seas and their crews perished without a trace. Just before the typhoon hit Hong Kong with maximum force, the doctors and nurses at the Mathilda Hospital decided to unite all the babies with their mothers and leave them unattended in the maternity ward. They reasoned that it would be better for the mums and bubs to perish together. The medical staff then wisely went to the safety of the small typhoon shelter. The typhoon was so severe that the Morants (a French family who befriended us during the Second World War) told us several years later that their garage door, which was made of solid iron and which sat on open hinges, was lifted from its position by the wind and tossed away like a paper plate. Their car, which had its parking brake on, was sucked out of the garage and flung down the slope. The maternity ward in Mathilda Hospital was devastated by the powerful gusts of wind. All the windows were smashed and there was utter chaos in the ward. But when the doctors and nurses emerged from the typhoon shelter a day later they discovered that all the mothers and their tiny infants had miraculously survived. It was my first lucky break. RELIGION FINDS ME IN CANTON. When the Great Typhoon of 1937 had abated, the tramp steamer took the four of us to Canton. Our arrival there was hardly auspicious. The Japanese were soon bombing that city as part of their military advance on Southern China. My mother was very religious and she was afraid that if I was killed by a Japanese bomb before I had been baptised I would languish forever in limbo. She sent my father to find a Russian Orthodox priest in Canton who would baptise me. Apparently, there was a shortage of Russian Orthodox priests in Canton at the time. My father could find only one such creature in the city. And when he met him he was horrified to discover that it was the same person who had been his archenemy in a seminary in the Ukraine at the beginning of the 20th century. The two of them were both studying there for the priesthood then. In the Orthodox tradition, the priest immerses the child fully into the water and my father was afraid that his deadly enemy would drown me. He refused to have me touched, let alone baptised, by that particular priest. Almost hysterical with fear for my spiritual well-being, my mother asked her many clients for advice. At the time, my mother had quickly established a successful dressmaking business in Canton. Edward the Eighth of England had abdicated, and his brother, Albert, was about to be crowned King (as George VI). In spite of the fact that the Japanese were then merrily bombing Canton, the European elite of the city was determined to celebrate the coronation of a far-away British monarch with style and grace. Thus my mother and her 16 Chinese tailors were kept busy making dozens of ball-gowns for the coming festivities. One of my mother's best customers was a Frenchwoman. She was a Catholic and married to a French banker... and by that I mean that he owned the bank. Being a good Catholic, and always looking out for new recruits, this good woman reminded my mother that there was just the one God and that she should have me baptised as a Catholic instead. Mother's chief tailor was a Cantonese called Awai. He was like an uncle to my brother and me. He agreed wholeheartedly with my father. This was in spite of the fact that Awai was a devout Buddhist for he too was a practical man. After all, there was no economic or political advantage to being Russian Orthodox in China at that time. Finally, my mother relented, and the French banker and his wife agreed to be my Godparents. However, when the time came for the baptism there was yet another Japanese air raid. The banker's wife was too scared to attend but her husband braved the bombs and became my Godfather. I do regret the fact that my courageous Godfather and I parted company shortly thereafter and never met again. He did me a great service by ushering me into the bosom of the Catholic Church as this quite probably saved our lives during the Second World War. But more about that later. Suffice it to say that, whereas my parents and brother were Stateless and Orthodox, I was doubly blessed by being both British and a Roman Catholic. My Guardian Angel, provided by the One and Only True Church, has looked after me extremely well through many difficult times. Even when I left the bosom of the Church years later, my Angel stayed by my side! I am most grateful for his continuing protection. SAFE IN HONG KONG AGAIN... or so it seemed. Somehow my father managed to obtain visas for the family to return to Hong Kong. Apparently, having a child in the family who was British by birth was an advantage in obtaining visas for all of us. While my mother established her dressmaking business in Hong Kong, my father was soon successful in prospecting for minerals. With both my parents gainfully employed, this was a short period of considerable comfort and stability for us. We lived in a spacious flat in Kimberley Road, Kowloon, and I vividly recall the tricycles that my brother and I rode around the flat. Since my mother was very busy with her dressmaking salon, I had my own baby amah to care for me. I became very attached to my amah as I spent most of my time with her. In this respect, my early upbringing was similar to the very wealthy children in Europe who had little contact with their parents, and became very close to their nannies. My father was away a great deal in the New Territories, as he spent most of each week supervising the operation of the mines which he had prospected there. Although my father had little formal education, apart from his studies for the priesthood in Ukraine, he had acquired valuable lessons in prospecting for minerals from his elder brother. This brother had been responsible for diamond prospecting in Siberia during Tsarist times. He was so successful in this endeavour that, after the Russian Revolution, the Bolsheviks put him in charge of diamond prospecting in the Urals as well as Siberia. It turned out that my father was an apt pupil. Several of the mines in Hong Kong and its New Territories owed their existence to my father's talent for discovering minerals of various kinds. By the early Forties, the British authorities in Hong Kong were well aware that the Japanese posed a threat to the Colony in the near future. Since Britain itself was under siege from the Nazis and fighting for its very survival... this was the time of the Battle of Britain as well as the Battle of the Atlantic... there were few military resources which could be spared for the defence of Hong Kong. Furthermore, in 1921, the British had agreed to limit the fortifications of the colony and this had increased its vulnerability. The government began a program to build air raid shelters in the colony and my father was employed by the Marsden company to supervise the construction of some of them. By late 1941, the Japanese controlled most of the area in China just to the north of Hong Kong. For the defence of the colony the military commander of Hong Kong, Major-General Maltby, had only 14,000 troops. The force was made up of Canadian, British and Indian regiments as well as Hong Kong Volunteer Defence Corps. Maltby only had five antiquated aeroplanes at Kai Tak aerodrome. These were no match for the Japanese Zeros which were among the best fighters of their day. In the Harbour, there was only one destroyer, a few gunboats and a small flotilla of motor torpedo boats. The Japanese attack began on December 8th, 1941, the day after Pearl Harbor. They had massive superiority on land, sea and air. The Allied troops resisted bravely, suffering severe casualties and inflicting punishment on the Japanese invaders, but after 17 days of brutal fighting General Maltby advised the Governor that further resistance was futile. The American fleet had been decimated at Pearl Harbor and the British had lost two of their capital ships, the Prince of Wales and the Repulse, to Japanese bombers off Malaya. There was no prospect of relief from the sea. The defenders of the Colony were on their own. On Christmas Day, 1941, Hong Kong surrendered.